50 Line Jacks or Better - play now! 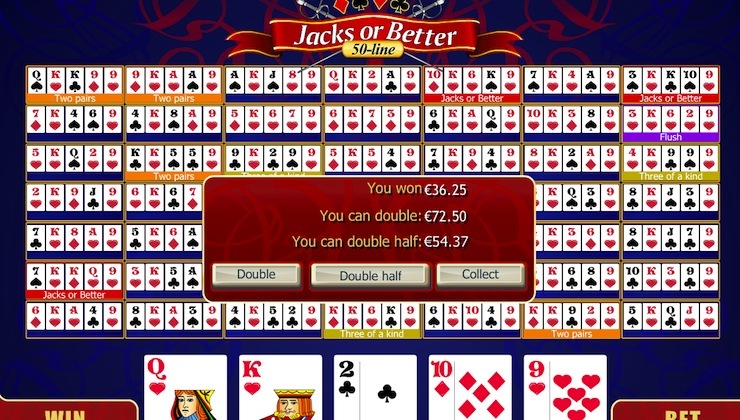 50 Line Jacks or Better is a version of Jacks or Better Video Poker that is played across 50 separate lines, and each line is treated as a separate in order to calculate the winnings. This means that the game has a much higher chance of winning than the regular game of Jacks or Better video poker. Unlike other casino games where the house always holds an advantage, with some careful playing and strategy, it is possible to beat the odds and create a small player’s advantage over the house, which is one of the reasons that this game is so popular. Firstly you need to choose the value of the coins that you wish to bet in each round. This can be done by clicking on the +/- buttons on the right of the screen. Next, click on the Bet One or Bet Max in order to select the number of coins that you wish to bet. Every click on the Bet One button simply adds another coin to the bet. Clicking on the Bet Max aptly increases your bet to the maximum limit. The Bet amount is always shown on the Bet screen right in the lower right corner of the window. The next procedure involves you to Click on Deal and then you have to choose the cards that you wish to keep with you. This can be done by pressing the Hold button that lies under the card. Then you have to Click Deal in order to replace the cards that were not chosen by you to hold. After the all the cards have been completely replaced, the player's cards are checked and searched for any winning combinations. In case you have a few winning hands on multiple lines all your winnings are simply added up. 50 Line Jacks or Better doesn`t include a progressive jackpot or bonuses, except for stunning winnings for Flash Royal if your bet is maximal. According to the manufacturer`s estimation, following optimal strategy can bring you up to 98.39% payouts.